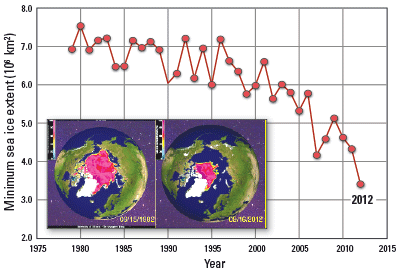 Summer sea ice in the Arctic is melting at an alarming rate. Arctic sea ice extent (shown in pink in the map insets) declined to an all-time low on September 16, 2012. Data courtesy of the National Snow and Ice Data Center; maps courtesy of University of Illinois. The Arctic is warming faster than other regions of the world due to positive climate feedbacks associated with loss of snow and ice. One highly visible consequence has been a rapid decline in Arctic sea ice over the past 3 decades—a decline projected to continue and result in ice-free summers likely as soon as 2030. The polar bear (Ursus maritimus) and the Pacific walrus (Odobenus rosmarus divergens) are dependent on sea ice over the continental shelves of the Arctic Ocean’s marginal seas. The continental shelves are shallow regions with high biological productivity, supporting abundant marine life within the water column and on the sea floor. Polar bears use sea ice as a platform for hunting ice seals; walruses use sea ice as a resting platform between dives to forage for clams and other bottom-dwelling invertebrates. How have sea ice changes affected polar bears and walruses? How will anticipated changes affect them in the future? Female polar bear with two dependent young feeding on a seal. 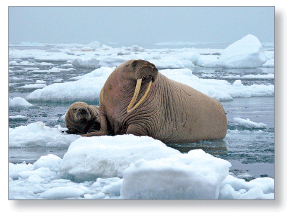 Female walrus with her calf resting among unconsolidated ice floes. Through the Changing Arctic Ecosystems (CAE) initiative, the U.S. Geological Survey (USGS) strives to inform key resource management decisions by better understanding how wildlife populations of special interest to the Department of the Interior (DOI) are responding to rapid physical changes in the Arctic (Geiselman and others, 2012). The CAE initiative includes research themes spanning ice-dependent marine and terrestrial ecosystems of the north—the sea ice, and the broad zones on land underlain by continuous and discontinuous permafrost. This theme focuses on the sea-ice dominated environment and will produce new information about polar bears and walruses to better inform policy decisions. The DOI listed the polar bear as threatened under the Endangered Species Act in 2008, and a listing decision on the Pacific walrus will be made in 2017. Understanding how climate warming affects the pelagic and benthic food webs that support polar bears and walruses is paramount to successful conservation of these species. CAE will produce information useful to decisionmakers managing oil and gas exploration and development in the Chukchi and Beaufort Seas, and for addressing challenges posed by increased shipping and other economic opportunities in a more accessible Arctic. USGS has led research on polar bears and walruses for the DOI for many years, and the CAE initiative is supporting new integrated studies that target critical data gaps. Here, we introduce the conceptual framework for the sea ice-dependent marine mammal research theme and highlight our goals and early findings. Schematic of a portion of the Bayesian Network model used to forecast the status of the Pacific walrus under a range of sea-ice conditions (Jay and others, 2011). 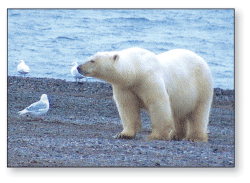 A similar type of model was used to forecast the status of polar bear populations (Amstrup and others, 2008, 2010). CAE uses Bayesian Network models as a framework for projecting the status of wildlife populations in the 21st century under various scenarios of ice change. This type of model defines the primary relationships between stressors and the population based on a wide range of knowledge sources, including empirical data and professional judgment from scientists and traditional ecological knowledge from local residents. Model inputs can be varied to determine associated output sensitivity. This sensitivity analysis quantifies important uncertainties in the forecasts. CAE uses the network models to identify important knowledge gaps and prioritize future research and modeling efforts. For polar bears and walruses, key data gaps include assessment of habitat quality and how changes in habitat affect animal energetics and health or condition, and ultimately, population dynamics. The Pacific walrus population winters in the Bering Sea. In spring, females and their young migrate with the sea ice as it retreats northward and then spend the summer over the continental shelf of the Chukchi Sea. The loss of sea ice habitat in the Chukchi Sea is believed to be one of the greatest influences on future Pacific walrus population dynamics. In recent years, sea ice receded northward beyond the edge of the continental shelf, causing walruses to haul out in large aggregations on the shores of Alaska and Russia. 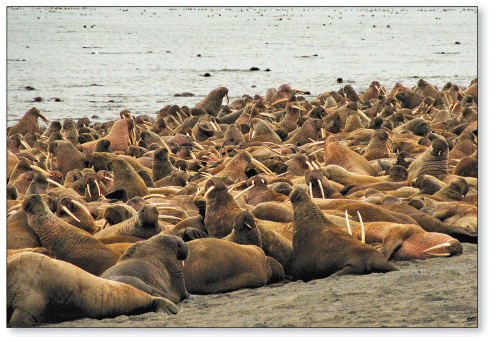 While onshore, young walruses are susceptible to mortality from stampeding events. In addition, hauling out on shore is likely to constrain foraging to nearshore areas, which could become depleted of benthic prey. We are focusing our studies on understanding how changes in the use of habitat by walruses affect their energetics and ultimately the dynamics of their population. We are studying walruses in captive facilities to gain additional empirical data on bioenergetics. Here, Shawn Noren (University of California, Santa Cruz) and Holley Muraco (Six Flags Discovery Kingdom) take ultrasound measurement of Siku, an adult female, housed at Six Flags Discovery Kingdom, California. Pacific walruses spend the majority of their time in water and are extremely difficult to study using standard methods involving animal captures. Various complementary approaches and creative techniques are required to understand how sea-ice change is affecting walruses. 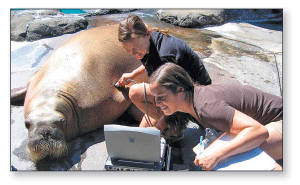 USGS has developed a satellite transmitter that can be remotely attached to adult walruses using a crossbow. Transmitters deployed on walruses in the Chukchi Sea over the past several years have provided data to identify important seasonal movements and foraging areas. Information from tagged animals helps us quantify changes in activity patterns associated with foraging from shore resulting from the reduced availability of offshore sea ice. 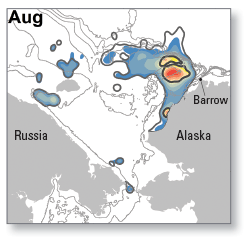 Walrus foraging hotspots in the Chukchi Sea during August, 2008-2011. Data from walruses tagged with satellite-linked transmitters. From Jay and others (2012). We have developed a bioenergetics model for female walruses that allows us to estimate their food requirements during critical life history stages (for example, early growth, pregnancy, and lactation). 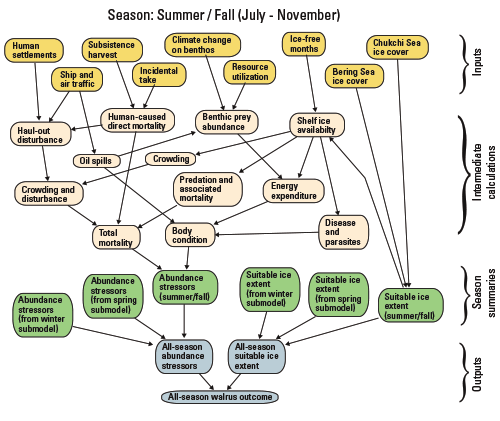 This model helps us understand how changes in activity patterns and associated changes in energy expenditure due to loss of sea ice may affect reproductive success and survival. To strengthen our understanding of walrus population dynamics, we are developing methods to estimate the age structure of walrus groups that hauled-out onshore and on the ice. We also are looking for signatures of life history events, such as the ages of weaning and first reproduction in walrus teeth, which have annual growth rings. Because teeth have been routinely collected from harvested walruses in the past, we may have the ability to quantify how these vital rate parameters have varied over time, providing valuable empirical information on population dynamics. Polar bears are strong swimmers. Using data from polar bears with satellite telemetry collars, we have described long-distance swimming events by Southern Beaufort Sea polar bears during recent years of extensive open water (Pagano and others, 2012). Polar bears live across the circumpolar Arctic among 19 recognized populations. The Chukchi Sea and the Southern Beaufort (SB) Sea populations occur in Alaska, and are shared with Russia and Canada. In this region of the Arctic, the sea ice melts and drifts away from the coast during the late summer and fall, and polar bears have historically remained with the ice during this period. Like walruses, the concern for polar bears is how they will cope when the ice that normally provides a foraging and travel platform over the continental shelf is absent for a longer period each year. The USGS has been studying the SB population since the 1980s, and long-term data on this population have provided a baseline for understanding their response to current and future sea ice changes. During spring we capture and remotely biopsy dart polar bears on the sea ice as part of a mark-recapture program to estimate abundance and characterize population vital rates. 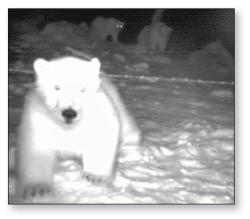 We deploy satellite transmitters on some captured bears to further understand movements, behavior and habitat use. Information to quantify their health, body condition, and diet is also collected. This wide array of information about polar bears provides insights into the ecological mechanisms responsible for changes in the population and informs our understanding of potential population response to future environmental change. Polar bear cub crawls under a strand of barbed wire at the bowhead whale bonepile in Barrow, Alaska, leaving behind a tuft of hair that provides a genetic fingerprint and isotopic signature of diet. With more extensive and earlier sea-ice melt, more polar bears are choosing to move onshore when the ice recedes. We are studying the abundance, distribution, and diet of onshore bears to understand the significance of this behavior for the SB population. A unique feature in the SB region is the presence of subsistence-harvested bowhead whale remains that are annually deposited by local communities in three consistent locations along Alaska’s northern coast. These sites regularly attract many polar bears. We have established barbed wire corrals at two of the sites to collect hair samples from bears that visit the whale remains. The samples are used to determine a genetic identity for each bear and an isotopic signature of their diet, allowing us to determine how many individuals are using the whale remains, and how important the consumption of the remains is to the population. Polar bear on a barrier island. Polar bears that stay on the north slope of Alaska are spending on average 34 days on land in contrast to 9 days in prior decades. CAE is developing and using new approaches and technologies to advance our understanding of a changing Arctic. In this research theme, we are applying new satellite telemetry technologies as described above. In addition, we are using Next Generation DNA sequencing technology and classical genomics techniques to develop biological markers of gene expression that can identify the effects of environmental stressors on immune system function. This information will help us understand how environmental change influences physiological processes and, ultimately, population health. Amstrup, S.C., DeWeaver, E.T., Douglas, D.C., Marcot, B.G., Durner, G.M., Bitz, C.M., and Bailey, D.A., 2010, Greenhouse gas mitigation can reduce sea-ice loss and increase polar bear persistence: Nature, v. 468, no. 7326, p. 955-960. Amstrup, S.C., Marcot, B.G., and Douglas, D.C., 2008, A Bayesian network modeling approach to forecasting the 21st century worldwide status of polar bears in DeWeaver, E.T., Bitz, C.M., and Tremblay, L.-Bruno, eds., Artic sea ice decline—Observations, projections, mechanisms, and implications: Washington DC, American Geophysical Union, Geophysical Monograph Series, v. 180, p. 213-268. Durner, G.M., Whiteman, J.P., Harlow, H.J., Amstrup, S.C., Regehr, E.V., and M. Ben-David, M., 2011, Consequences of long-distance swimming and travel over deep-water ice for a female polar bear during a year of extreme sea ice retreat: Polar Biology, v. 34, p. 975-984, doi:10.1007/s00300-010-0953-2. Fischbach, A.S., Monson, D.H., and Jay, C.V., 2009, Enumeration of Pacific walrus carcasses on beaches of the Chukchi Sea in Alaska following a mortality event, September 2009: U.S. Geological Survey Open-File Report 2009-1291, 10 p.
Geiselman, Joy, DeGange, Tony, Oakley, Karen, Derksen, Dirk, and Whalen, Mary, 2012, Changing Arctic ecosystems—Research to understand and project changes in marine and terrestrial ecosystems of the Arctic: U.S. Geological Survey Fact Sheet 2011-3136, 4 p.
Jay, C.V., and Fischbach, A.S., 2008, Pacific walrus response to Arctic sea ice losses: U.S. Geological Survey Fact Sheet 2008-3041, 4 p.
Jay, C.V., Fischbach, A.S., and Kochnev, A.A., 2012, Walrus areas of use in the Chukchi Sea during sparse sea ice cover: Marine Ecology Progress Series, m 10057, doi:10.3354/meps10057. Jay, C.V., Marcot, B.G., and Douglas, D.C., 2011, Projected status of the Pacific walrus (Odobenus rosmarus divergens) in the twenty-first century: Polar Biology, v. 34, p. 1065-1084. Noren, S.R., Udevitz, M.S., and Jay, C.V., 2012, Bioenergetics model for estimating food requirements of female Pacific walruses (Odobenus rosmarus divergens): Marine Ecology Progress Series, v. 460, p. 261-275. 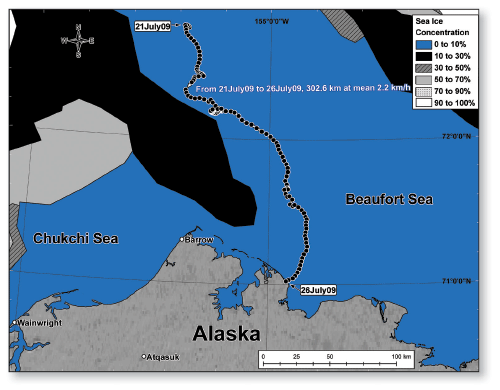 Pagano, A.M., Durner, G.M., Amstrup, S.C., Simac, K.S., and York, G.S., 2012, Long-distance swimming by polar bears (Ursus maritimus) of the southern Beaufort Sea during years of extensive open water: Canadian Journal of Zoology, v. 90, p. 663-676. 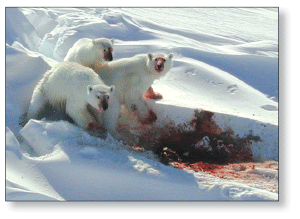 Oakley, K., Whalen, M., Douglas, D., Udevitz, M., Atwood, T., and Jay, C., 2012, Changing Arctic Ecosystems—Polar bear and walrus response to the rapid decline in Arctic sea ice: U.S. Geological Survey Fact Sheet 2012-3131, 4 p.